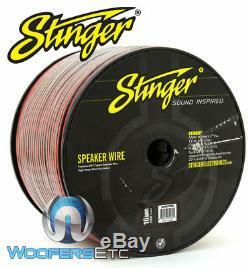 SPW516RB - Stinger 16 AWG 1,000 Feet Speaker Wire. Of 16 Gauge Pro Series Speaker Wire (Red/Black). Flexible insulated jacket provides easier installation and less signal interference. Smooth outer coating for easy installation. True to Gauge for better signal transfer. Chemical and Temperature Resistant Jacket. Made from 100% Oxygen Free Copper (OFC) Copper. You will be issued a Return Authorization Number. In order to maintain an inventory of 100%, Brand New, A-Stock, untouched products, all sales are final. We ask that you please be sure you are ordering the correct product. 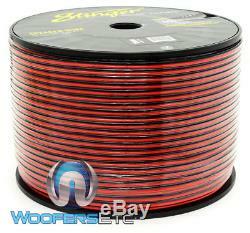 The item "STINGER SPW516RB 16 GAUGE 1000FT PRO 100% OFC COPPER SPEAKER WIRE RED & BLACK" is in sale since Thursday, March 10, 2016. This item is in the category "Consumer Electronics\Vehicle Electronics & GPS\Car Audio & Video Installation\Power & Speaker Wire". The seller is "woofersetc_outlet" and is located in Los Angeles, California.